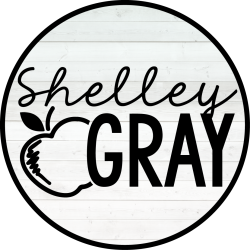 For those of you who have been following my blog or Facebook page for awhile, you are likely aware that I am a huge advocate of mental math. However, there was a time when I questioned what the big deal about mental math was. I was one of those teachers who firmly believed that students should learn how to add and subtract using carrying and borrowing, and that was that! Well, was I ever wrong. 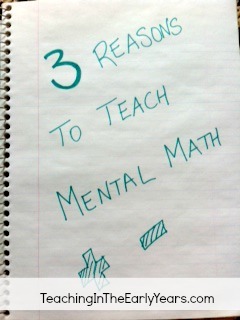 When I began teaching mental math, I was astonished at the growth that students experienced. Students who were not “mathematical thinkers” suddenly “got it!” And the students who were already mathematical thinkers became even quicker with their facts! For those of you who are wondering why you should start teaching it, here are three good reasons. 1. Mental Math encourages actual understanding, not just memorization. When you teach students how to add an equation such as 19+23 using carrying, you are teaching a series of steps. For some students, this will work great, and they will catch right on. But for some, it is downright confusing. Where do I put the number? Do I carry the first one or the last one? BUT, when you teach students to break down the numbers and add 10+20 to make 30, 9+3 to make 12, and then 30+12 to make 42, students learn a deep understanding of the numbers. Suddenly that “1” in 19 is not just a 1. It’s a 10. And the “2” in 23 is not just a 2. It’s a 20. Students GET it! 3. Mental Math is fun! It is! I’m serious! When I began teaching this way, I really was re-energized about math. It is easier to understand, easier to do, and just all around exciting! I was actually getting better at math along with my students, which is probably why I’m a bit obsessed with it. Trust me, if you can teach math with excitement, your students are going to feel re-energized about math too! For those of you already using mental math, congratulations! You are helping your students in so many ways! They are learning skills from you that they will use for life! For those of you who are not currently using mental math, but who want to start, you are probably confused and unsure about where to begin. 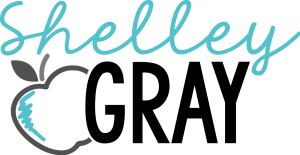 I have written a few other blog posts and filmed a few videos about mental math which you can find by visiting my Mental Math page by clicking here. Also, keep checking back here for more mental math tips and strategies. If you’d like to receive updates by email, be sure to enter your email address into the box in the top right hand corner of this page. In closing, I would love to hear from you in the comments section. Do you currently teach mental math? If so, what is your greatest challenge? I look forward to hearing from you and addressing some of your successes and challenges in future posts/videos.